Hello Everyone and Happy Thanksgiving! I hope that you all have a very happy thanksgiving surrounded by family, friends, and loved ones in celebration of what you are most thankful for. Today, I'll be headed over to my parents house with my family to spend time and enjoy everyone's company....and to help my mom cook her fantastic Thanksgiving dinner! 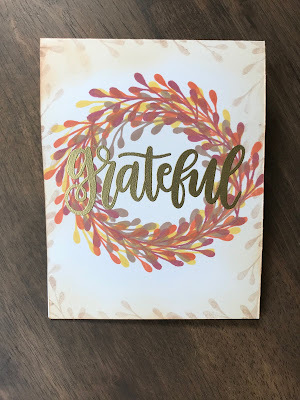 For my third and final Thankful card this week, I'm featuring the Concord & 9th Give Thanks Stamp Set and the My Favorite Things Words of Gratitude Die Set (which looks like it may be discontinued but there are several alternatives that can be used). I'm not sure what the proper term for this technique is but going to call it die cut dimensional inlay. This is the first time that I've personally tried it and I really LOVE how it turned out. 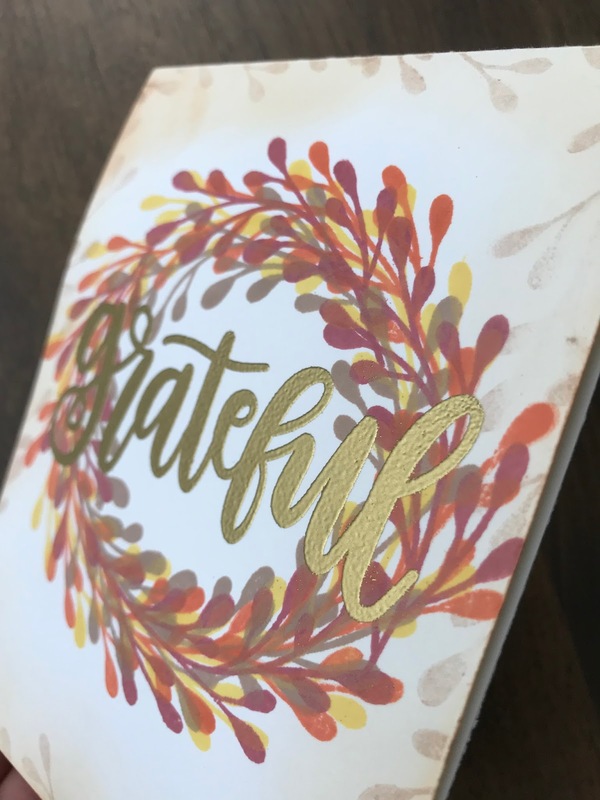 The thankful die cut is subtle but still stands out. Here's a video showing how I created this card using die cutting dimensional inlay. 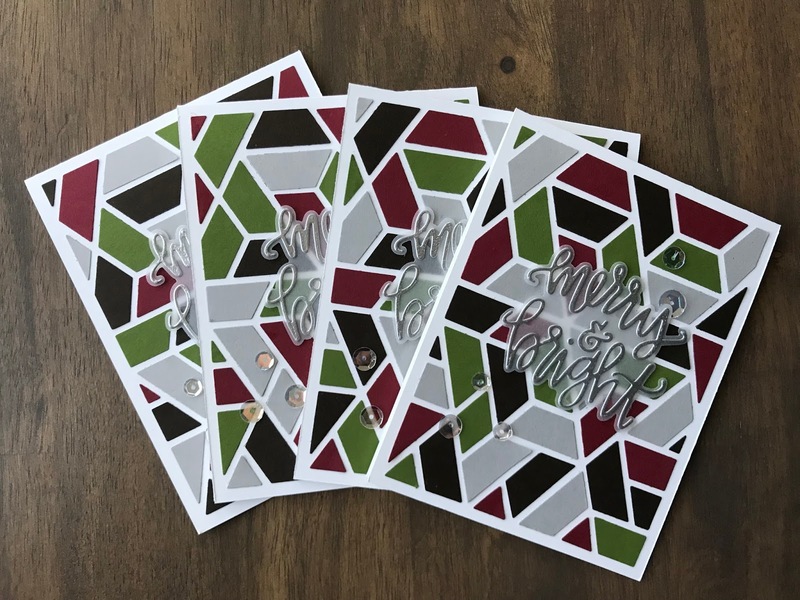 I hope you guys enjoyed these 3 Thankful cards created this week. 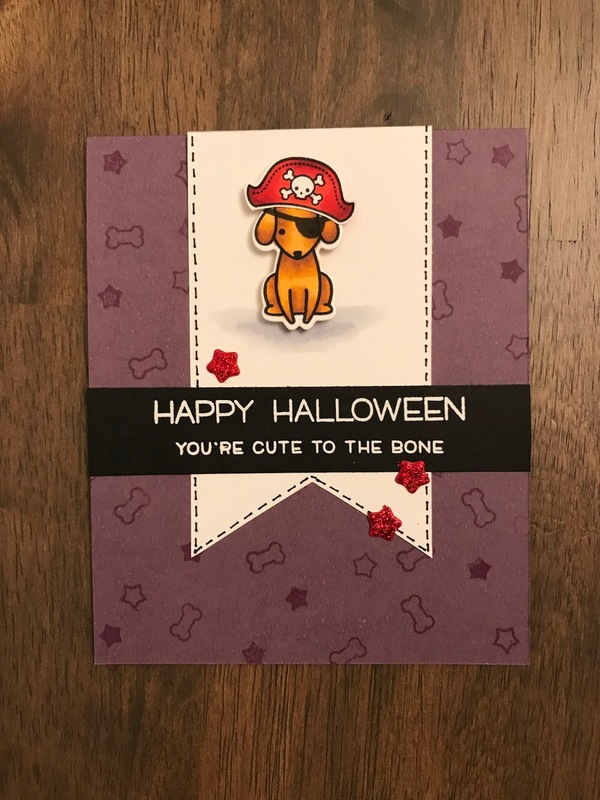 It pushed me to create more cards that I do not normally create, which is a good thing. Check back soon, as I'll be starting the Holiday Series of 2017 in the near future!! As promised, I have a few more fall/thankful cards for you all. I can't believe that Thanksgiving is this week...where did the month of November go?! For today I have a OHWC (One Hit Wonder Card), meaning I'm strictly using one stamp set to create the whole card with very little extra embellishments or other dies. Today's card features My Favorite Things Grateful Stamp set. 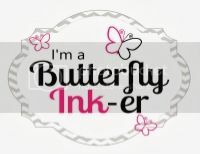 I simply adore the font used for this stamp set, so much can be done with the flourish, and the price point is fantastic. I'll be back very soon with another Thankful card for you guys. I have 2 more to showcase this week! Hey Everyone, I'm back a lot quicker than usual today. 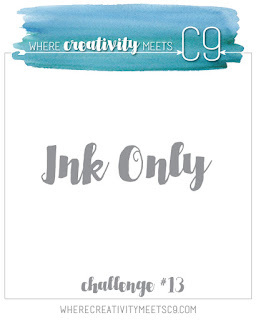 I wanted to join in with Concord & 9th's challenge over at Where Creativity Meets C9. This challenge was all about using ink only and it was the perfect chance to use my Concord & 9th Triangle Turnabout Stamp. With the weather cooling down and it finally feeling more like Fall here in Jersey, I decided to turn my idea into a fall card. I used Lawn Fawn Inks in Doe, Fake Tan, Sunflower, and Pumpkin Spice to stamp the Triangle Turnabout background. I wanted to create my own sentiment to read Hello Fall and so I used a variety of different Concord & 9th stamp sets for this. The Hello portion is from the Concord & 9th Flourishes Stamp set and the Fall portion is stamped using the Sophisticated Script in upper and lowercase. 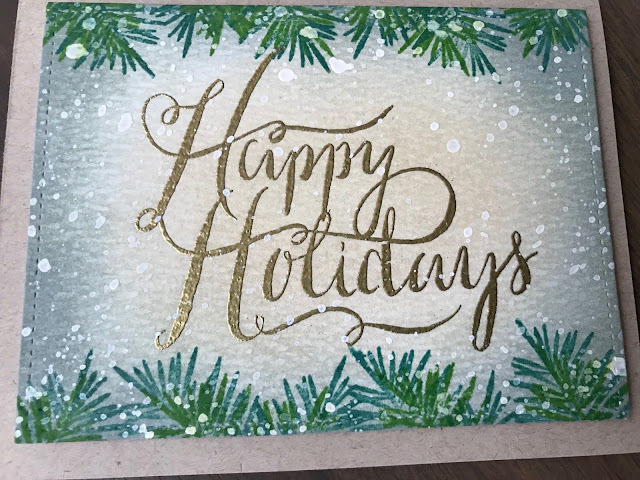 The cardstock was prepped with my EK Success Powder Tool, stamped in Versamark Ink, heat set with Ranger Super Fine Detail Gold Embossing Powder. To add a little more emphasis on the word Fall, I took a Versamark Marker and ran it along to sentiment. Since I was trying to keep this card pretty simple and strictly using ink and very minimal embellishments, I decided to draw some dots with my Versamark Marker and heat set them with the same Ranger Gold Embossing Powder to look like sequins. And that's it for me today. 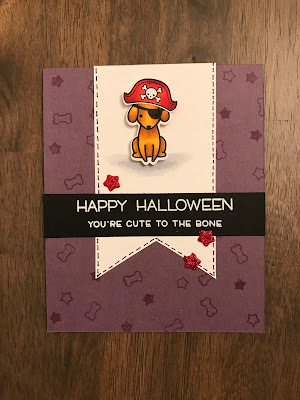 I hope you guys enjoyed this card as well! And I'll see you back soon for another project. Hey Everyone! 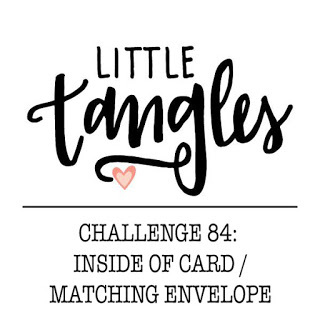 I'm back again with a card and envelope to join in the challenge fun at the Neat & Tangled challenge blog, Little Tangles. Hope you guys enjoyed and I'll be back with another project for you very soon! Hope your week is off to a good start. Here, in Jersey, it feels like the peak of summer with 85-95 degree weather. It seems as though, as soon as Fall officially hit, Mother Nature decided to throw in a curve ball. 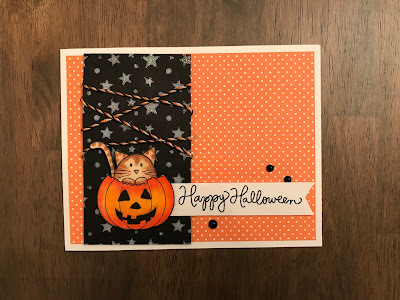 Today, I have a card for you that I created for the My Favorite Things Color Challenge #77. As soon as I saw this challenge, Baby card popped into my head and I went with it. 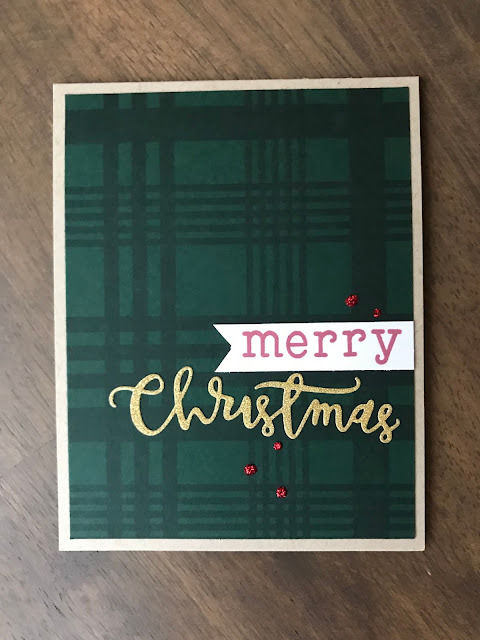 I'm featuring a variety of products from My Favorite Things to complete this card. 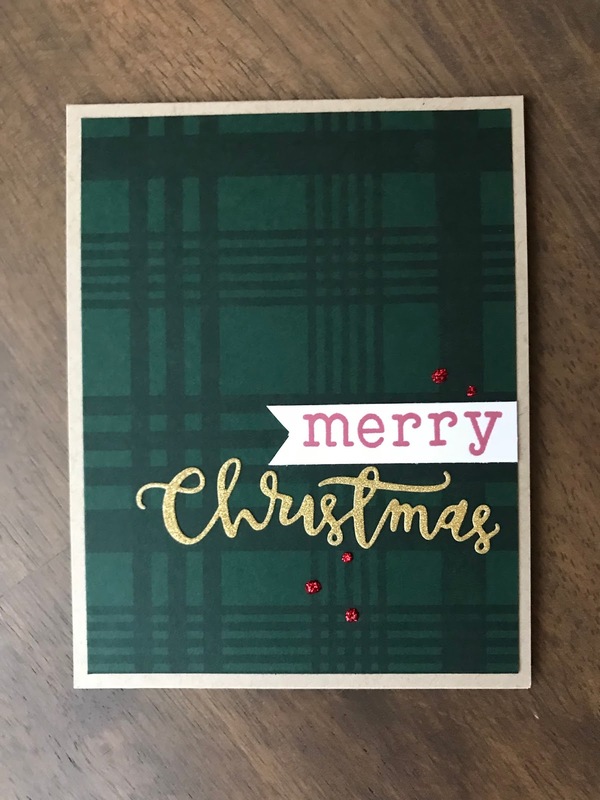 I started out by stamping my background with MFT Diagonal Stripes with Lawn Fawn Blue Jay Ink in my MISTI. Next, I stamped the images from MFT Adorable Elephant stamp set with some Versafine Onyx Black Ink and heat set it before using my ZIG Clean Color Real Brush Markers to color my images. 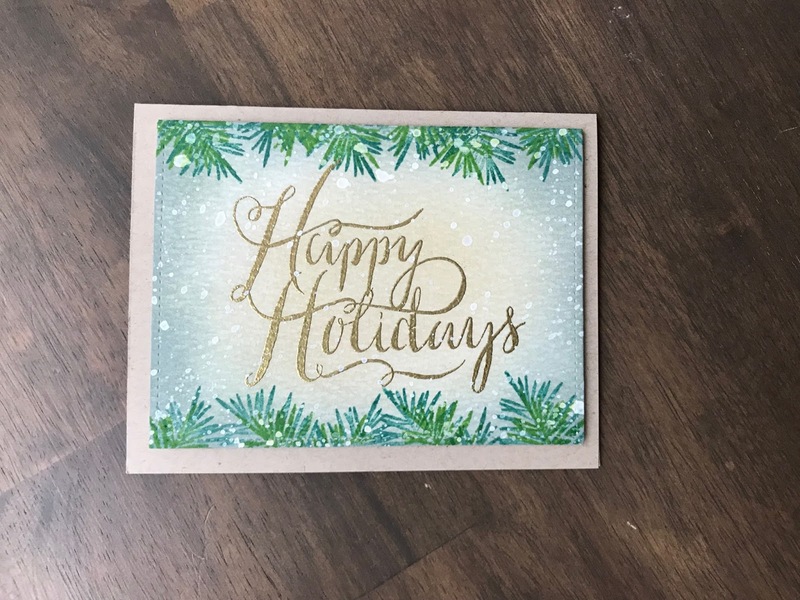 While I had all of my inks out, the sentiment Congrats from MFT Welcome, Baby was stamped in Versafine Ink and while the ink was still wet, I poured some Ranger Super Fine Detailed Clear embossing powder on it and heat set it. To give the adorable elephant a spot on my card, I'm using the scalloped rectangle from MFT Blueprints Tag Builder #3 and cutting it out of some pink cardstock and creating a mat with some white cardstock and rounding the corners. Copic markers were used to create some ground for the elephant to be standing on. Now its time to assemble all of the pieces onto the card. I applied some glue tape onto our background piece and adhered it the grey colored card base. Using the same glue tape, I also attached the mat and scalloped rectangle with some glue tape. I popped the scalloped rectangle up onto the card using some Scotch Foam tape and also attached the elephant, with his balloon, with some foam tape. 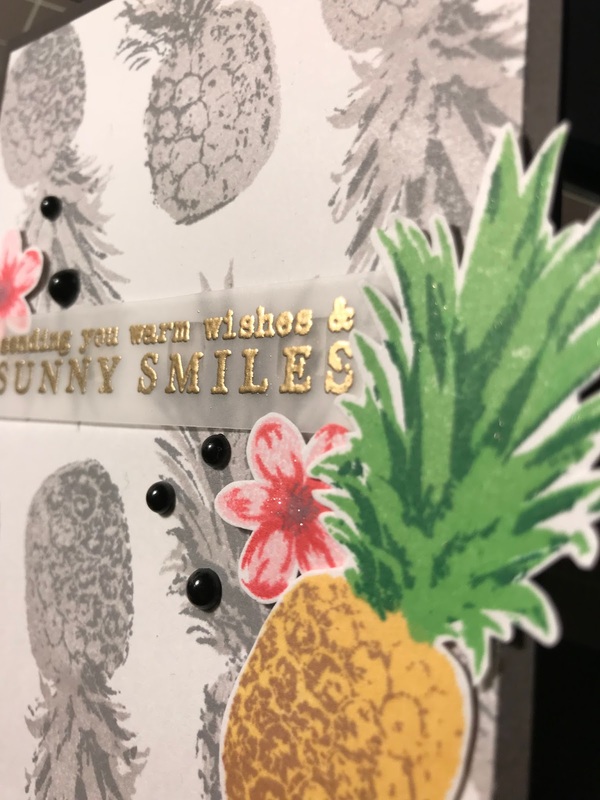 The sentiment was also attached to the card with some foam tape, however, as the sentiment is on vellum, I decided to use some Kool Tak to make it less visible. The finishing touches added to the card were some Enamel dots and some Pico Embellisher, which I forgot to shake, so it appears more like glossy accents. 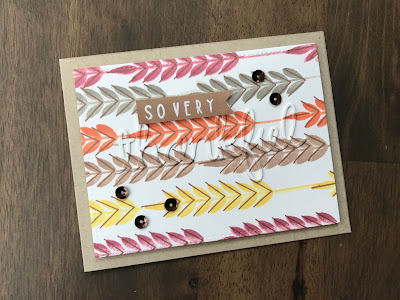 And that completes my card for the MFT Color Challenge. I hope you guys enjoyed it and I'll be back with another project soon! Today I'm a guest designer over on the Butterfly Reflections Ink Blog with a card featuring the Hero Arts Color Layering Pineapple Stamp Set. 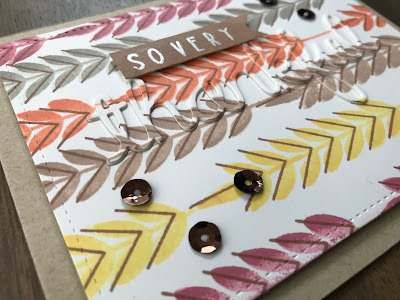 Head on over to the blog to see how I created my card and to find direct links to all of the products used on my card! Today I am, finally, back with a project for you guys. Neat & Tangled has been celebrating their 5th Birthday for the entire month of August. 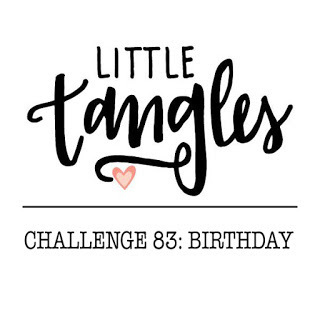 I was beyond excited to join in on the fun this month with the Little Tangles challenge and created a birthday themed tag. 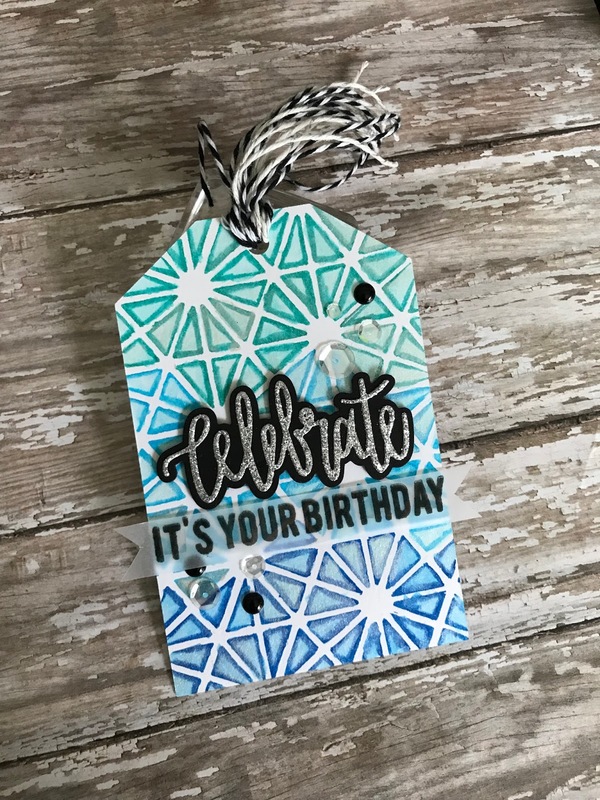 For my tag, I'm featuring the Neat & Tangled Celebrate Stamp & Die, Hexastar Cover Plate, as well as the Neat & Tangled Classic Tag 2 Die. I wanted a fun ombre feel with shades of blue. 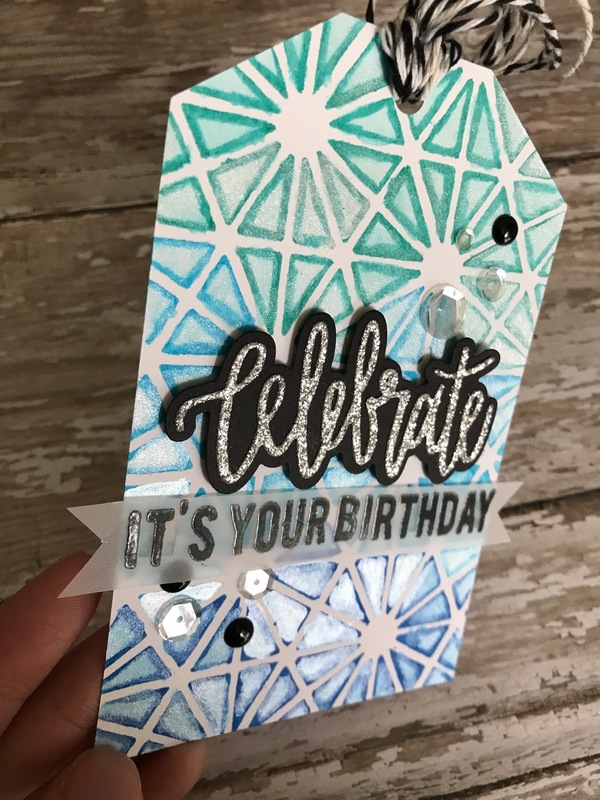 I really wanted to Celebrate die cut to really pop off the tag, so I used some black cardstock for the shadow and some silver glitter cardstock for the word. The Gansai Tambi Pearl Colors give an amazing metallic effect, which you can see here in the second photo. Hey Everyone! I know it has been a RIDICULOUSLY long time since I have posted anything on my blog and YouTube Channel. 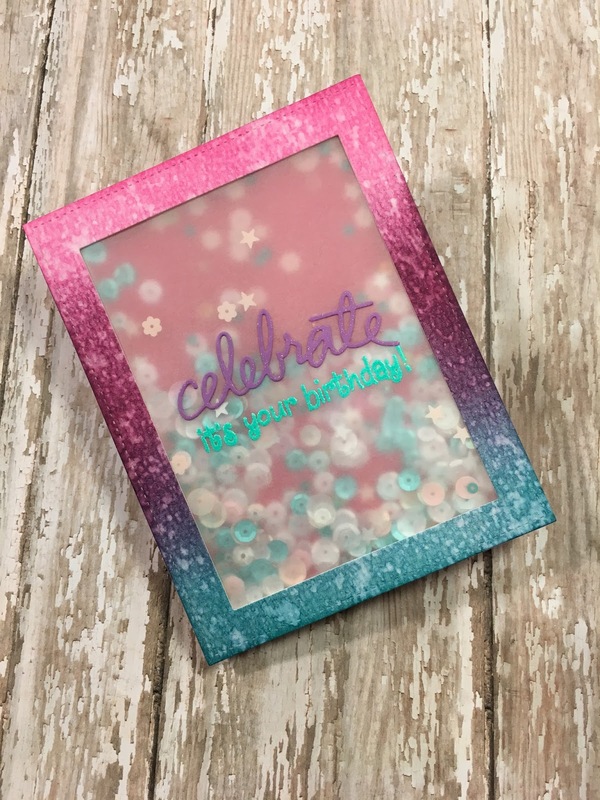 Today I'm being featured over at the BRI Blog with a Celebrate Birthday Shaker Card for you guys. 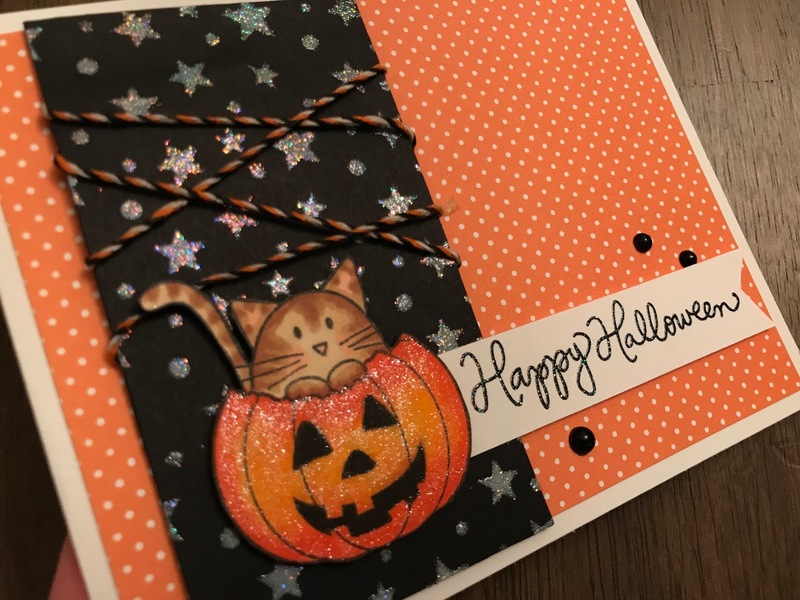 Head on over to the BRI Blog by clicking HERE to watch a video on how I created this card and direct links to the products I used!